Off Season Sports Academy now offers 2 Batting Cages! You can come out during your off season and practice hitting, during the season for extra practice, or come on out just for some fun. 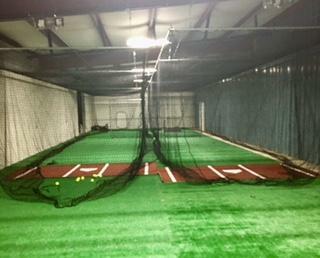 Both cages will consist of a cage with a tee, 12 baseballs/softballs and a protective screen (L screen) for your pitcher. A batting helmet will be required at all times while in the cages for those that are 18 years old and younger. You will be required to bring your own bat and if you would like extra balls to practice with, you'll need to bring those as well. Check out our Iron Mike Pitching Machine! Any child age 10 and under must be accompanied by a parent while using the pitching machine. A helmet is required to be worn by anyone that uses the machine. MEMBER: $100--This will get you 10 Half Hour visits. (This is a $120 value). NON-MEMBER: $125--This will get you 10 Half Hour visits. (This is a $150 value). You will be required to sign a liability waiver before using the cages. If under 18, a parent or guardian will be required to sign the waiver for their child.